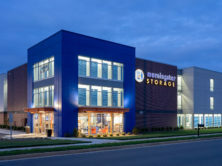 Edifice was selected to provide construction services for long time client, Morningstar Storage. This building located in Lake Wylie consists of a three-story, climate controlled mini storage building that will house 583 individual storage units, a rental office with an employee break room, 2 elevators, and restrooms. The exterior walls are precast concrete with a structural steel interior support.